If you have a look at Motorola Droid X, you may notice the Droid X is compatible with DLNA service. DLNA, as the short term for Digital Living Network Alliance, is to make it possible to view media between PCs, mobile devices and other consumer electronics. If you have a home wired or wireless network, e.g. Wi Fi network and a DLNA-capable TV, you can stream music, movies and photos from Droid X to TV. DLNA make it an alternative method to watch Droid X videos on TV besides HDMI output with Verizon Gallery app. Since we may sometimes do not have DLNA PC or transfer videos from PC to Droid X, we may face the problem of putting movies to Droid X. Here the guide will include two parts: one for converting movies to Droid X and the other for streaming movies from Droid X to HDTV. We need a powerful video to Droid X converter on Windows computer to make most videos compatible to Droid X. Aunsoft Video Converter is the right choice for converting TiVo, MKV, MTS, TOD, AVI to Droid X MP4. Step 1. Run Aunsoft Video Converter as the perfect Droid X video converter, and click the "Add" button to load HD videos in formats like .tivo, .ts, .mkv, .mts, .avi, .rmvb. Step 2. Choose Motorola Android MP4 format by clicking the "Format" option and navigating to Android > Motorola Droid (X) H.264 Video(*.mp4). Step 3. 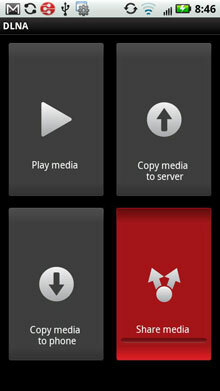 Convert HD videos to H.264 MP4 for Droid X by clicking the start button under the preview window. After conversion, connect Droid X to PC via USB cable, and transfer videos to Droid X under the DCIM > Camera folder. The DLNA service could be used as a stand alone, or used in combination with HDMI. A home network (wired or wireless) or WiFi network shall be set up with your DLNA compatible TV and Droid X. Step 1. Turn on Droid X and the TV, and select DLNA application on Droid X to start sharing media files. If you get the message to turn on Wi Fi connection, just click Yes and go to the settings menu to turn on Wi-Fi. Step 2. From the DLNA screen, select "Share media", and select the media (Video, Music, Picture) you want to play in the "My shared media" screen. Then click OK. Step 3. Wait for a few seconds for connecting Motorola Droid X to TV, and a green DLNA logo will appear at the top of Droid X screen for sharing movies and other media files to TV. With the steps above, you can easily play Droid X video on TV through DLNA. Hope it helps you play around your Motorola Droid X Android phone. Aunsoft Droid X Column, Put/play videos on Motorola Droid X, Transfer DVD to Droid X for Playback, Rip DVD ISO Image to Droid X MP4, Play DVD IFO in Motorola Droid X, Convert AVI files to Motorola Droid X, Convert MKV files to Motorola Droid X, Convert VOB Files to Motorola Droid X, Convert WMV/WMV HD to Droid X, Mount Videos to Motorola Droid X, Convert Blu-ray to Motorola Droid X, Convert M2TS to Motorola Droid X, Convert TiVo to Motorola Droid X, Stream Droid X Videos to HDTV via DLNA, Play Droid X Gallery Video on TV via HDMI.